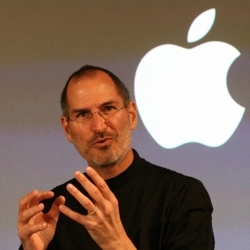 My old boss, Steve Jobs, has passed away. To anyone who knew him or knew how Apple worked, his death has been on the cards for a while. For to him, to step down from Apple, only an impending illness of fatal magnitude would do. Steve Jobs was scary, intense, and a 100% platinum-plated genius [at least, he appeared that way to a young graduate in his first job]. He kind of needed to calm down. But you just knew he never would. The light that burns twice as bright burns for half as long – and you have burned so very, very brightly, Steve. As a science fiction author I have perhaps one minor talent, and that is that I see the future, or at least predict how things might unfold. Steve Jobs did one better, he created the future. Everything I learnt about design and marketing, I learned at Apple. Goodbye, Steve. You created Apple, Pixar, buried the old-school music industry, and the Lord knows what you would’ve achieved if you had stayed around a little longer.